The Ringling's volunteers selflessly donate their talents and thousands of hours each year. Their dedication, knowledge and enthusiasm greatly enhance the experience of our visitors. More than 500 strong, with a wide variety of backgrounds, they are one of the largest support groups at The Ringling. Without their passion and commitment, The Ringling could not perform its mission as effectively. 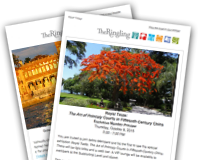 We hope that you will consider volunteering at The Ringling and help us share the legacy of John and Mable Ringling. To see your information on VICky Home, please click the button below and sign in using your email address and password. As the "face" of The Ringling, volunteers serve in a variety of roles. Available opportunities vary from season to season, and while we do occasionally offer opportunities with more flexible schedules, most positions carry a minimum weekly commitment of approximately one shift per week. Some volunteer roles, such as docent, require a more significant time commitment. Please see volunteer opportunites for our current needs as well as general listing of volunteer assignments. Individuals interested in volunteering with The Ringling are required to complete our on-line Volunteer Application, participate in a one-on-one interview with a Volunteer Services staff member and complete our orientation and training program. The Ringling welcomes applications from individuals ages 16 and up who are enthusiastic, self-directed and sincere in their desire to make a commitment to the Museum. Students seeking community service hours toward Bright Futures scholarships or those looking to obtain valuable experience are invited to apply. As available opportunities may be somewhat limited during the academic year, we encourage students who wish to be considered for possible summertime assignments to submit applications in the spring. Many positions require new volunteers to successfully complete training beforehand and commit to a regular shift over an extended period of time, so please give careful consideration to your personal schedule and transportation needs before applying. Applicants ages 16 and 17 are required to submit a signed and notarized Parent/Guardian Consent Form and documentation verifying proof of age, such as a copy of their driver's license, along with the Volunteer Application. The Ringling's volunteers receive many benefits through their association with The State Art Museum of Florida and the largest university museum complex in the country. In addition to meeting new friends and learning new skills, volunteers may also become eligible to receive discounts on membership and in our stores and restaurants, as well as complimentary admission and guest passes. If you are considering a volunteer opportunity with The Ringling, we encourage you to complete our online Volunteer Application. Once the application has been submitted, a member of our staff will contact you if we have available assignments that could be a good match for your interests and schedule. We can also help to answer any questions you may have at that time. To accompany the application, individuals ages 16 and 17 will also need to submit a signed and notarized Parent/Guardian Consent Form along with documentation verifying proof of age. Docents facilitate conversation-based tours based on the Ringling's collections and special exhibitions in the Museum of Art , Ca'd'Zan and the Circus Museum.